STRIKKS designer knits: a designstudio for designer knits. We are a young designstudio that creates knitted textiles and textile products for it’s own brand and collections of others, located in Maastricht, The Netherlands. We are a lab for research of all possibilities in knitting and production processes. We love to co-create with other designers, architects and companies. We design and develop (innovative) knitted products and textiles, product lines and collections. Besides the love for knitted design we have the drive and know-how to grow into a platform for all that is related to industrial knitting. STRIKKS is working on a collection in constant development. Interior textiles, fashion items and lifestyle accessoires make 1 big collection all together. Simply put: you plunge into your sofa wearing your favorite pullover, wrap yourself up in a warm blanket, then you leave (for just a minute) to do the dishes with that great towel! Our vision in design is that everything that takes up space in your universe should be well thought of. As well as comfort, looks and style, quality, feel and sustainability are just as important. Because who doesn’t want a matching scent with that favorite jumper that gives you that special feeling each time you put it on? Or who doesn’t want that blanket to contribute to the styling of your room, even when it’s not used at that particular moment? Would you like to see how we realize this? Follow us backstage. We develop every knit on our own machines. There, we welcome the experiment and unexpected results which are part of the feedback to the concept. We strive to solutions not thought of before. In our designs you’ll find a fascination for contrasting materials and elaborated techniques. But surely also just that little persuasion why knitting is a technique that can be used for everything that surrounds you. Our mission is to build a brand filled with smart products that can make your daily activities great again. Beautifully made products that make you feel great. It’s about designing moments really. Each day again. 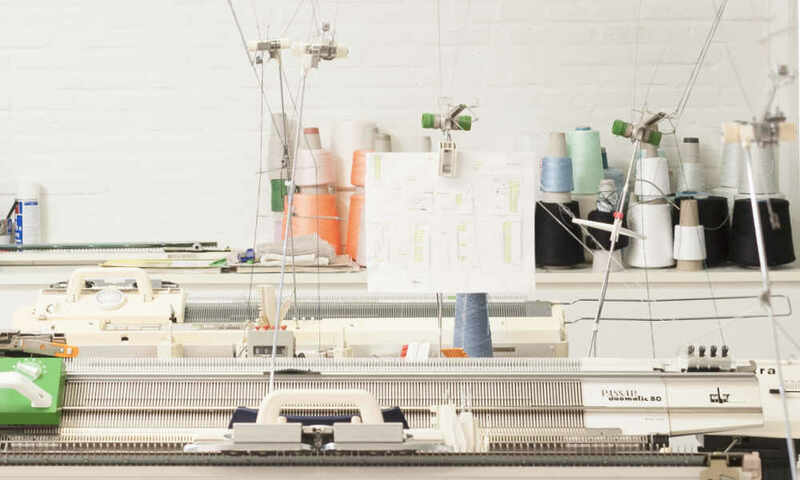 STRIKKS' specialist of yarns, machines & industrial knitting. Maartje teaches art academy students and many others their skills on the knitting machine. Probably even dreams of new exciting knitting techniques. For STRIKKS the one that creates the concepts, colors and strategies. She draws and plans the start and end very carefully. Then takes the photos, writes about it and is happy to start all over again.